I have been loving the Crafty Notions Spraypaques for a while - this is the first post where I mentioned them - but I haven't incorporated them into my cards for a while. However as i often do, I kept all my play pieces in a contained box ready for me to use when I needed them. The effect that you get with them is quite different from regular glimmer mists as this one is completely opaque and matt but just as shimmery. depending on the card that you spray on you will get different results, looks very beautiful and subtle on chipboard, very striking on glossier card. I recommend however thicker card, specially if you are going to emboss it and sand it as I have done for this card -I used the Collage and Notebook set Tim Holtz Texture Folders for Sizzix. 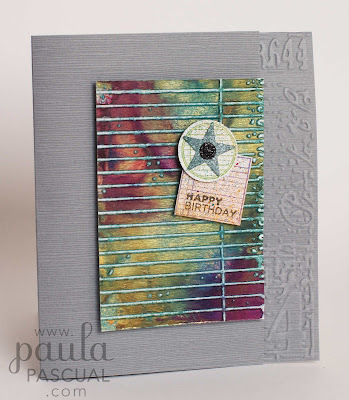 Then I stamped the journaling spots on a glimmer mist card -much more subtle and fine mist- and punched them out using the 1" circle and 1 1/8" square punch. I added the message from the Punchable labels set. Beautiful, I love this card. Scrumptious!